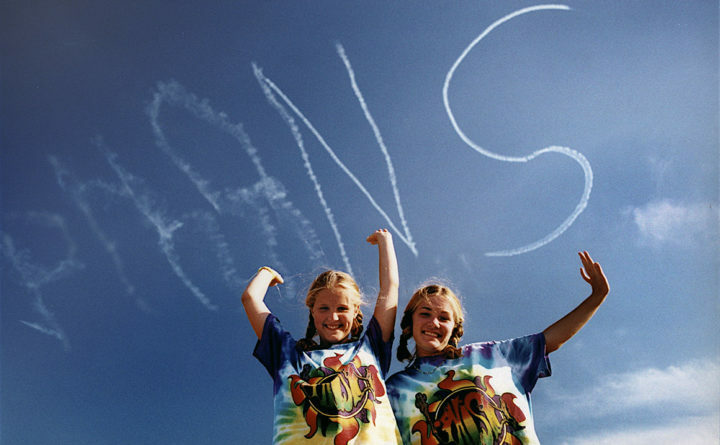 Phish "phans" are seen here under skywriting during the 1998 "Lemonwheel" festival at the former Loring Air Force base in this photo taken by former UMPI Art Professor Andy Giles. Beloved Vermont jam band Phish announced Wednesday it will play two nights of concerts at the Darling’s Waterfront Pavilion in Bangor this June. Trey Anastasio, Mike Gordon, Jon Fishman and Page McConnell will perform in Bangor on Tuesday, June 25 and Wednesday, June 26, as part of a 26-date summer tour. A ticket request period is currently underway at tickets.phish.com, ending at 10 a.m. Monday, Jan. 21. Tickets go on sale to the general public via Ticketmaster beginning Jan. 26, and are priced between $45 and $85. Phish last performed at the Darling’s Waterfront Pavilion in 2013, but the band has a long history in the state of Maine, stretching all the way back to when they were a cult favorite New England band, playing shows at college campuses across the region, including at the University of Maine in Orono and at College of the Atlantic in Bar Harbor, both in the late 1980s and early 1990s. After rocketing to mainstream fame in the mid-1990s thanks to successful albums “Rift,” “Hoist,” “A Live One” and “Billy Breathes,” the band became especially known for its festivals, three of which were held at the former Loring Air Force Base in Limestone. The Great Went, held at Loring in August 1997, attracted more than 75,000 people, featured the Bangor Symphony Orchestra, and was the highest grossing rock concert in the U.S. of 1997. Lemonwheel, held at Loring in August 1998, attracted 60,000 people, and “It” again attracted more than 60,000 people to Loring in 2003. Phish and members of the band play in Maine frequently, including their 2013 Bangor concert, and a 2016 concert at the Cross Insurance Arena in Portland. Drummer Jon Fishman is a longtime Midcoast resident and plays with Maine bands regularly, including a mini-tour last year with the Mallett Brothers Band. He co-owns the Lincolnville General Store with his wife, Briar, and is a selectman for the town of Lincolnville. The Phish concerts join previously announced shows at the Darling’s Waterfront Pavilion, including Ozzy Osbourne and Megadeth on June 15, Florida Georgia Line on July 18, and Train and the Goo Goo Dolls on July 30. More concert announcements will be coming in the next few weeks.